Our weekly residential at the Priory Arms, Stockwell started its 2014 run with a cracker of a night. We saw a a smorgasbord of cabaret comedy delights take to the stage, complete with bizarre conspiracy theorist magicians and a 60 second rendition of the charge of the light brigade. 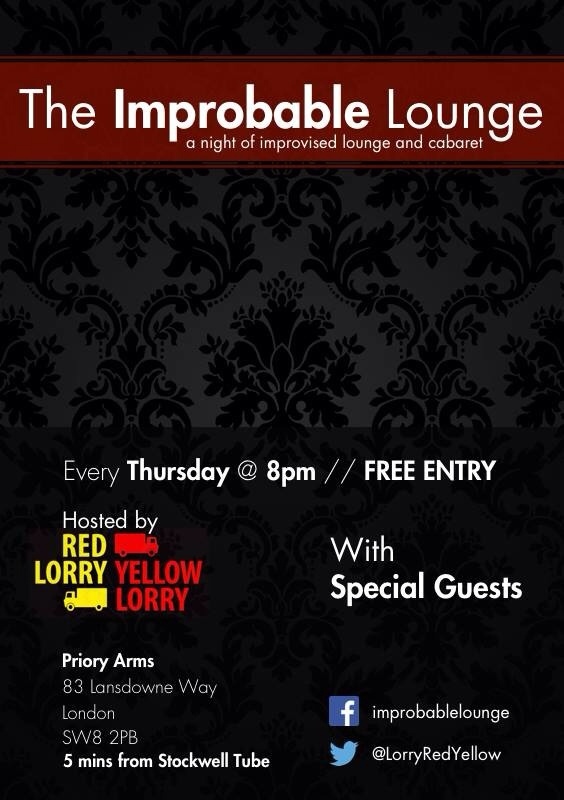 Every Thursday in 2014 – our residential Improbable Lounge, at the Priory Arms, Lansdowne Way, Stockwell, London – 8pm start. Free! A delicious night of musical comedy, improv & cabaret. Intimate tables, posh beer, lovely food – and free entry! Thursday nights just got a whole lot better! We hope that you've all had a wonderful Christmas filled with cheer and goodwill. And that you're gearing up for 2014…. 2013 has been good to us and we are still over the moon at our brand new weekly residential night at the Priory Arms, Stockwell. 5 mins from the tube! The Improbable Lounge is every Thursday and is a fun and laughter filled evening that will whisk you away to the cabaret nights of Berlin….although our acts are distinctly modern and the cream of the emerging talent on the musical comedy and improv scene. With some quirky weirdness thrown in for good measure (and fun). Best of all – it's all free. Nada. Not a jot. So please come down, bring your friends, tell random strangers on the tube. We really appreciate your support and love every one of you! Some of the lorries have been in the garage over the summer, while some of us went on road trips to various improv haunts. Apparently there was a festival in Edinburgh, for example. It looks like a crazy old improv variety night and we can't wait. See you there! So we caught up with the MC, in the first of our new series of '5 mins with' interviews with fab improv folk. Improv outlet: I'm not actually involved in improv myself, I'm a singer and stand-up who's just starting learning about the world of improv through starting to MC and run the We Are Funny Variety Show at Dirty Dicks. 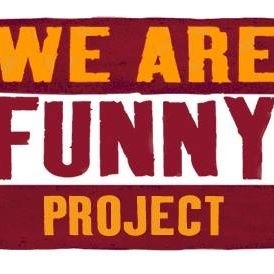 Tell us about we are funny in a nutshell: The We Are Funny Project, run by Alfie Noakes, is a project dedicated to supporting grass roots comedy in all its forms. It provides a platform for new and experienced comedians to learn and hone their trade and offers the best managed open mike nights in London. Apart from improv, what other hats do you wear: I'm a Sign Language Interpreter. I've been a British Sign Language User for 12 years and I'm heavily involved with the Deaf Community (by that, I mean I've been getting drunk with the Deaf Community for 12 years. I'm very good at it). Other hat – the getting drunk hat. See previous comment. Improv philosophy: Rather than Improv philosophy, here's my life philosophy – Enjoy life and help others to do the same. Anything else achieved along the way is a bonus. Best improv moment: I remember doing improv in youth theatre when I was a teenager. I snogged someone who wasn't expecting it and then stormed out of the building. That was fun. What makes you happy: Joy. And my bear costume. It's a full proper adult's bear costume. The zip's broken now though. I wear it too much.